Published Mar 30, 2017 by Sams. Part of the LiveLessons series. Big data and business intelligence have been two of the major IT trends in the last five years. This video shows the viewer how they can capitalize on those trends by using tools that they already own. Business intelligence is the science of mining data and using it to derive business value. It typically requires complex tools such as Microsoft’s Power BI. The goal of this video series is to show how to perform custom business analytics and build business dashboards using nothing but PowerShell. This video series is entirely hands on. It explains key concepts while actually building PowerShell-based business intelligence dashboards and applications. Lesson 1 is intended to be introductory in nature. This lesson explains what Business Intelligence is and how it is commonly used. This lesson also demonstrates Microsoft Power BI, Microsoft’s off the shelf Business Intelligence solution, before finishing off by making the case for using PowerShell as a business intelligence tool. Lesson 2 explains how to use PowerShell as a data mining tool. This lesson demonstrates how to use PowerShell to extract data from a number of different sources including the Active Directory, the Windows operating system, event logs, CSV files, SQL Server, and remote servers. Lesson 3 describes the process of building a GUI interface for PowerShell. It also provides instructions for adding various GUI controls including labels, text boxes, buttons, list boxes, radio buttons, and check boxes. Lesson 4 is an introduction to creating charts in PowerShell. It describes how to install the charting controls, and how to build a basic chart. From there, the lesson goes on to demonstrate the creation of a number of different types of common charts, before moving on to a discussion of charts that use multiple data series. Lesson 5 starts out by explaining how to sort PowerShell’s output, with an emphasis on ordered hash table data. From there, the lesson focuses on less commonly used chart types such as bubble, area, pyramid, funnel, and doughnut charts. Lesson 6 is designed to take many of the concepts discussed in the first five lessons, and combine them into some sample scripts. This lesson explains how to build full blown GUI applications using PowerShell, how to create interactive charts, and how to build business dashboards. 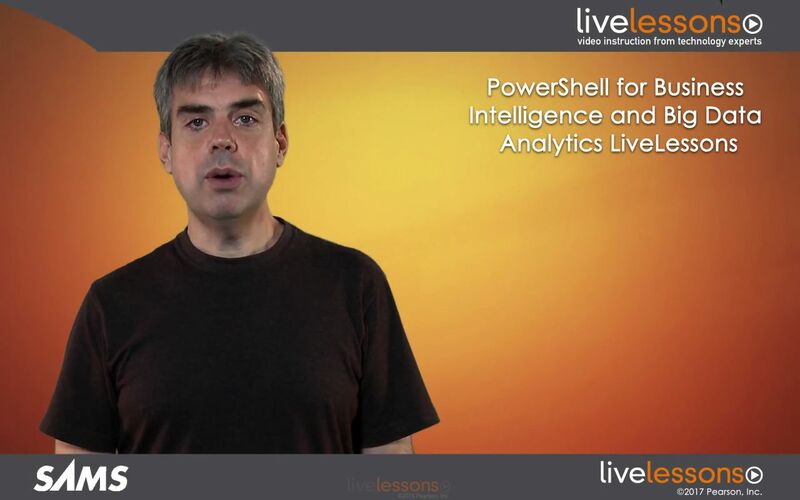 Lesson 7 demonstrates PowerShell’s ability to be used as a business analysis tool. The lesson demonstrates the creation of a number of financial reports, all of which are based on live business data from a backend SQL Server. The reports that are created include top 5 customers, projected accounts receivable, recent payments received, and top 5 overdue accounts. In addition, the video shows how to build a customer summary tool and how to integrate this tool and all of the reports into an interactive business dashboard. Lesson 8 demonstrates PowerShell’s ability to be used as a server virtualization management tool for the IT department. This lesson demonstrates how to build a number of interactive reports for host memory consumption, VM memory consumption, multi-host memory consumption, and VM summary information. This video also demonstrates how PowerShell can be used to create a GUI-based live migration tool, and how this tool can be combined with the various reports into an IT dashboard. 1.1 What is Business Intelligence?